The Big Gay Ice Cream Truck is back out on 17th and Broadway (sometimes. when the truck is working. and Doug's back hasn't gone out.) After eating gelato, Donny and I headed over to bother Doug about recipes say hi and see how his wonderful day was going. Also, I began stress-eating months ago and why should I stop now that I've gained 10 pounds? Whatever. There were specials. I walked over thinking about how much I needed a Salty Pimp with sprinkles, but once we got there, both of us admitted to thirst. Thirst that could only be quenched with root beer floats. 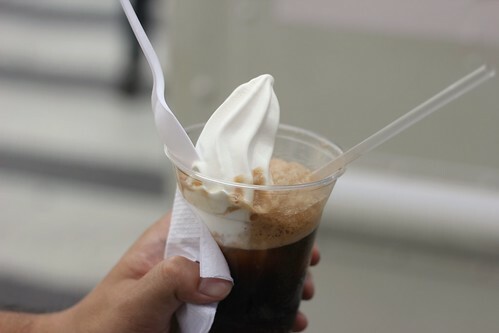 Doug uses fancy Sprecher's root beer that tastes like, well, awesome flavorful root beer, and covers a good half-cup swirl of vanilla ice cream with it. It's a pretty terrific root beer float. You should get one. 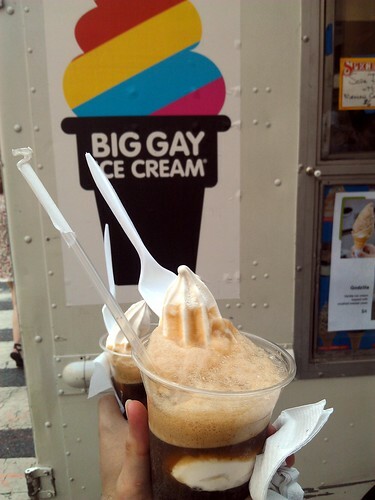 Check out their Twitter @biggayicecream before heading out and getting sad face upon seeing a fro-yo truck in their spot. I always love when they have new specials. Need to try the root beer float!